Funded by Nimick Forbesway Foundation, The Samburu Project will drill and install a shallow well equipped with a handpump in Sere Olipi Trading Centre. There is a great need to ease the pressure of overuse on the Sere Olipi Primary School Well which is 1 km away. It is estimated that 5,000 people are using this well! This has negative effects on the environment around the well and the well is also prone to frequent breakages. With this well, the distance to water will be reduced. Women will have more time to engage in other productive businesses. The well will be used for both domestic and livestock usage as well as small scale farming. Two sites were surveyed before finding a viable location. When I arrived at the Sere Olipi Trading Centre Well, I was greeting by 20 children. Many were just from school and still in uniform. They were excited to have visitors and share stories of their well! I have been hearing stories of Sere Olipi for a couple of years and was happy to finally see it for myself. Before The Samburu Project expanded into Sere Olipi in 2011, this part of Samburu East had never seen a hand pump. Clearly, this is a well that is heavily used. In the short time we were there, 10s of people took water including school children, women and warriors. When I asked how many people were using this well, I was told the whole town: 3,000 - 4,000 people! Because the well is in town, the area chief is the first point of contact and the one who is ultimately responsible for maintenance. There is also a water committee comprised of women, elders and local administration. No animals use this well because there are so many humans who are utilizing it. The community members use the well water for bathing, washing clothes, drinking and cooking. Prior to this well being drilled, the warriors and the women claim to have walked each day, many hours for water. Now, the water is close to their homes which gives them more time to tend to the animals and look for work in town. Some people have even started a water delivery business where they take water from the well and sell it to people outside of town. Some people have been thinking about starting a gardening project. One of the places where the community used to get water is from a dam that is about 5 kms away. The dam water was contaminated and salty, making people very sick with diseases such as diarrhea, gout, pneumonia, common cold and small pox. 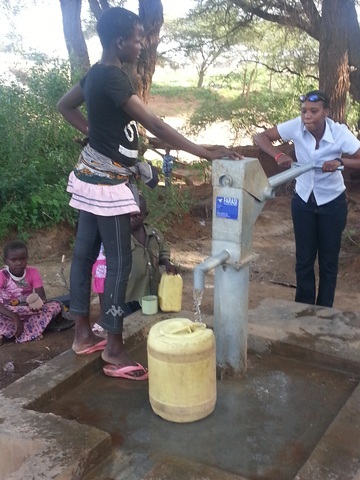 Today, well construction was complete and the community is happily pumping water! Water Struck at 52 Meters! Water was struck in Sere Olipi at 52 Meters! Pictures and completion forthcoming. Stay tuned! After urging from local leaders, Lucas and Kariuki decided to select an additional site in Sere Olipi to relieve the over burdened Sere Olipi Primary School Well. After surveying two locations, Kariuki found a viable well site.